The Asia’s largest cricket war is being screened from 15th of September in UAE. The 13-day-long war will be screened off on 28th September. 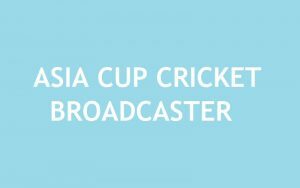 Star Sports has received the broadcast rights for the Asia Cup 14th edition. All nine of their TV channel will be covered all the Asia Cup matches. Star Sports will broadcast this year’s Asia Cup in different languages. Apart from this, the matches of the tournament will be seen by the audience. It can be seen on the Hotstar App and Hot Star website. The channel of the Stars which will cover the upcoming Asia Cup are Star Sports 1, Star Sports 1 HD, Star Sports 1 Hindi, Star Sports 1 Hindi HD, Star Sports Select, Star Sports HD, Star Sports 2, Star Sports 2 HD and Star Sports Tamil. Apart of these many different channel will also cover the tournament in different corner of the world. Here the full list of them. Star Sports will cover the live matches in India and the Subcontinent countries as well Bangladesh, Nepal, Bhutan, Sri Lanka etc. They have a long list of their media rights which are to broadcast the matches live. If you are Pakistani viewers then you can enjoy the match in PTV. The channel will cover only the Pakistan matches so far. Out of that Ten sports will telecast all the matches of the 14th edition. Besides of the Asian country, the matches also shown in United States, UK, Canada, Australia and Africa. Meanwhile, Asia Cup qualifiers will be held in Malaysia on 29th August. The United Arab Emirates, Nepal, Hong Kong, Oman, Singapore and Malaysia will compete there. Star Sports will not broadcast a match of the qualifier. Five teams in the six Asia Cup teams have already been confirmed. They are Bangladesh, India, Sri Lanka, Afghanistan and Pakistan. The sixth team will be determined from the selection before the start of the main event. Six groups will fight in two groups. Bangladesh, Sri Lanka and Afghanistan will fight in ‘B’ Group, India, Pakistan and qualifying teams. Bangladesh will compete against Sri Lanka in the inaugural match of the tournament. The top two teams of the two groups will play ‘Super Four’. Where four teams get one game to play against each other. The top two teams will then play the final. The final match will be held on 28th September. However, this season the ODI format game will be very interesting. The all participant teams are well prepared for the upcoming tournament. They are ready to face any situation and their target is to be bagged the Asia Cup Trophy. India, Pakistan, Sri Lanka are the most favorite of the title. Bangladesh is not less favorite as they are the last season runner-up contestant.